Extravagantly opaque, willfully vaporous — Aphex Twin's Selected Ambient Works Volume II, released by the estimable British label Warp Records in 1994, rejuvenated ambient music for the Internet Age that was just dawning. In the United States, it was his first full length on Sire Records (home to Madonna and Depeche Mode), which helped usher in Richard D. James, for whom Aphex Twin is but one of numerous monikers, as a major force in music, electronic or otherwise. 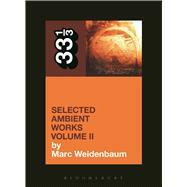 Faithful to Brian Eno's definition of ambient music, Selected Ambient Works Volume II was intentionally functional: it furnished chill out rooms, the sanctuaries amid intense raves. Choreographers and film directors began to employ it to their own ends, and in the intervening decades this background music came to the fore, adapted by classical composers who reverse-engineer its fragile textures for performance on acoustic instruments. Simultaneously, "ambient" has moved from esoteric sound art to central tenet of online culture. This book contends that despite a reputation for being beat-less, the album exudes percussive curiosity, providing a sonic metaphor for our technologically mediated era of countless synchronized nanosecond metronomes. Marc Weidenbaum founded the website Disquiet.com, focused on the intersection of sound, art, and technology, in 1996. He has written for such publications as Nature, Down Beat, and Boing Boing, and is a former editor at Pulse! and Classical Pulse! He's commissioned compositions by Scanner and Stephen Vitiello and edited music-related comics by Justin Green and Adrian Tomine, among many others. Weidenbaum lives in San Francisco, California, US.